University of Manchester & STFC Rutherford Appleton Laboratory, U.K.
Benjamin Radburn-Smith is a final year PhD student with the University of Manchester’s Particle Physics Group and the STFC Rutherford Appleton Laboratory’s Particle Physics Department, where he is based. 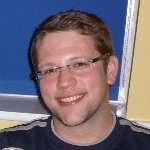 He joined the RAL CMS group and has been a member of the experiment since 2009. For his research, Benjamin is studying multivariate visualisation techniques which can be used in conjunction with a physics analysis. The visualisations of most interest include parallel coordinates and the grand tour. He is interested in physics beyond the Standard Model and works within the CMS Exotica group. He is currently investigating collimated groups of leptons called Lepton Jets, which are possible signatures of new physics.